I was reading the daily news in an online newspaper when something caught my eye: “A group of about 200 Xikrin Indians in Brazil have agreed to leave an iron mine they occupied on Tuesday.” My reaction was, 'Wow!' Exactly! I read a whole article and the only thing I found out was that these people live in Brazil. So, let’s see. 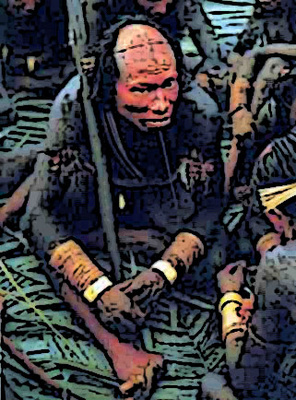 After some quick research, I learnt that the Xikrin live in Pará state and they occupy two Indigenous Territories, both approved and registered: Cateté IT and Trincheira Bacajá IT. The area of the Cateté Xikrin is drained by the Itacaiúnas and Cateté rivers and is situated on terra firma covered by tropical forest called ‘liana forest’ in this region. It is within the jurisdiction of the municipality of Parauapebas, but close to the urban centre of Carajás, plus it is an area rich in mahogany and Brazil nut trees. The Xikrin build their villages close to a river or creek, but on dry and well-drained land. The social space comprises of a central plaza encompassed by houses and the surrounding forest, with small circular swiddens. The houses possess a particular physical location and obey a set pattern, which is maintained whenever they build a new village or forest campsite. In the middle of the village is the Men’s House, a male, political, juridical and ritual space. Back now to the protest, the protesters - armed with clubs and bows and arrows - were demanding money and improvements to the infrastructure, while the owner of the Carajas mine, CVRD, said that the protest had stopped the export of 500,000 metric tons of iron ore. Amazing. The good old story all over again. Did they give shiny rocks and whisky in exchange? The government's Indian affairs agency said CVRD had not renegotiated aid with the Xikrin as agreed, but the company denied that was part of the accord. Was their part to steal and destroy? A spokesman for CVRD, the world's largest iron ore mining firm, said that no such clause existed and all the terms of the agreement were being honoured. The firm said it would not "negotiate with communities that utilise illegal methods to force the company to accept their demands." It's difficult to believe statements like that and it definitely makes you wonder if what happened in Peru needs to be done in Brazil as well, an Indian president or at least somebody who can see what’s really going on. Reading between the lines, I get overwhelmingly upset, but how can't you feel disappointed in the human race when you hear about acts that were even illegal in the 16th century happening in the 21st? What is more disappointing is when things like that come from Brazil, a country that considers itself a local superpower and an example of democracy in South America. All the group asked for was the company to improve the roads that they used because they are in a terrible condition after all of their work traffic, plus to build 602 houses for the tribal members in the two villages - something that had been agreed anyway, but obviously due to profit it didn't happen. All I can hope for is that I’m not the only one who read this news today and some kind of NGO or other organization will take a better look in that direction because it's not only a pity for Brazil, but for all earth to lose these people who hold the pure heritage of the human race.